Provide your Relationship Managers with a unique sales-marketing digital experience. Prospero Mobile App is a versatile multi-channel platform, which has been designed to be accessed anywhere: tablets and web client offer the same accessible interface. Our solution increases the productivity of your client-facing staff by reducing their administrative tasks. It enables advisors to focus on what’s important: higher value-added services that increase revenue and deepen client relationships. The results can be seen in solutions which deliver both a substantial reduction in the cost-to-serve and an increase in cross-selling opportunities. Why not give an even more amazing impression to your customers. 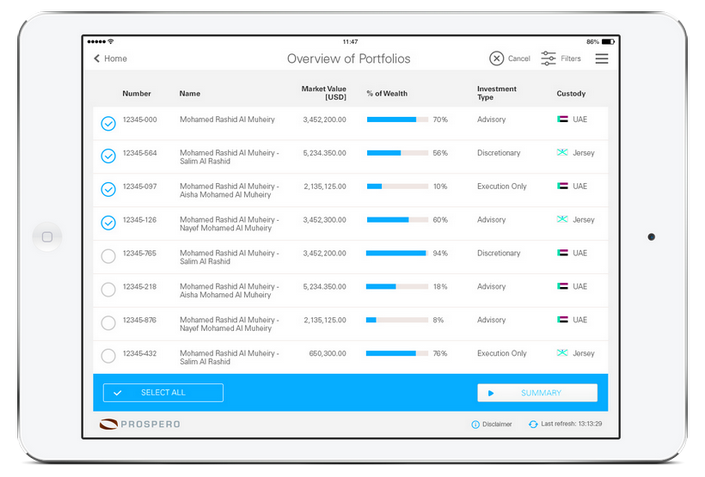 Our web client platform and tablet application provide relationship managers with a 360° overview of their customers portfolios valuation, performance, future cash flows and personal reports. 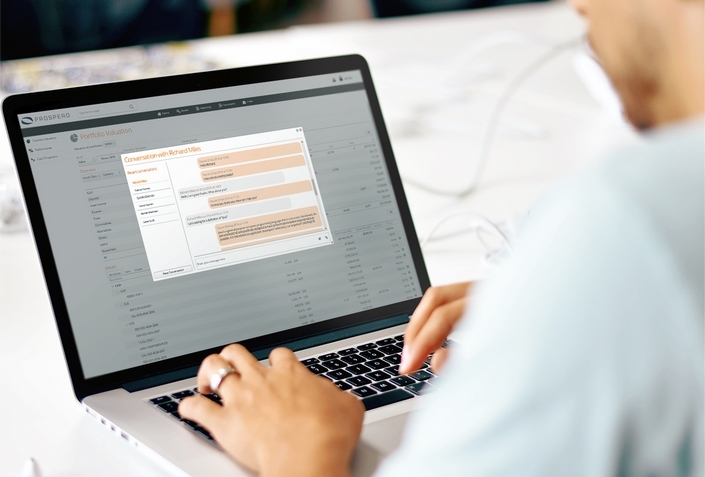 With Prospero you can export, print or share all the analytics and reports you need to with a single click of a button. If 30 years in this industry has taught us anything, it’s that the client is what drives success. When it comes to CRM, the initial C – client – should be capitalized to emphasize its importance. Our CRM tool reflects this view. 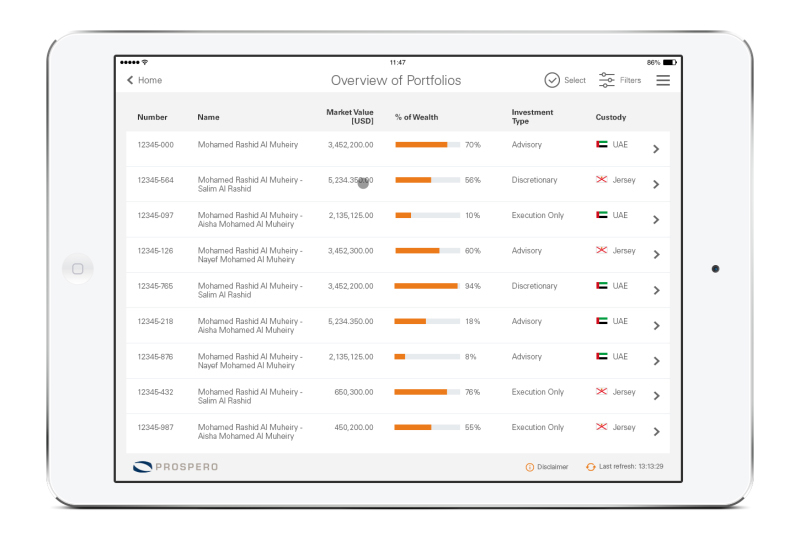 Track and manage clients’ investment goals and objectives, investment constraints and preferences. You can also set monitor and contact preferences (including reporting and sales-marketing) so that your relationship with the client matches their requirements. Just as no two wealth management companies are identical, no two software systems should be identical. Different enterprises will look for emphasis in different areas. Prospero’s white label solution allows you to increase your brand reputation with a high quality, easy to use digital application. You can customize the functioning, look and feel of your whole system just the way you want it. With Prospero, you have everything you need to create perfect relationships. Provide each individual customer with an exclusive digital relationship experience using the most modern features, such as secured messaging and report sharing. 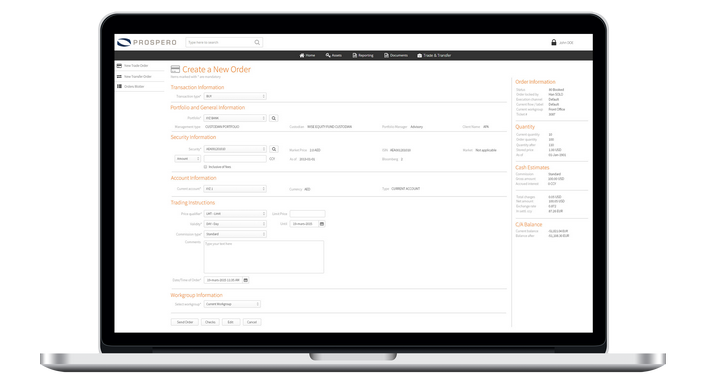 Web Client’s order management system simplifies the traditionally time-consuming process of filling out order books. Now, these are quickly and easily generated through pre-filled forms which are intuitive and easy to use. In addition, each time an order is being filled, the OMS runs a real-time compliance check to ensure the trade is compliant. 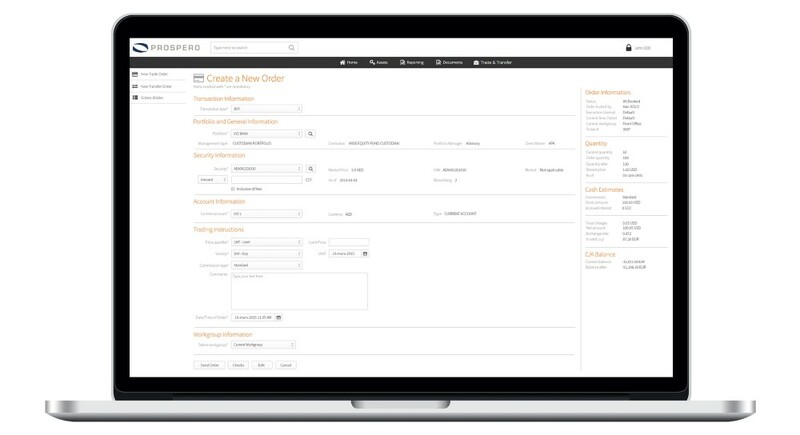 Prospero’s customizable dashboard provides a 360° overview of daily tasks, notifications and recent activities. It allows you to get where you need to go in minimum time.